The KL3116T Dual Rail Touchscreen KVM Switch is an integrated LCD console and KVM (keyboard, video, and mouse) switch that offers secure access to 16 attached computers, and mounts in only 1U of rack space. It features an independently retractable 17" touchscreen LCD monitor and keyboard with built-in touchpad. 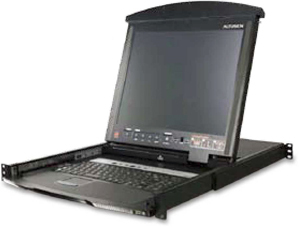 The KL3116T is ideal for industrial environments such as factory production lines, laboratories, and server rooms, or anywhere else an LCD KVM switch is required. Anyone working on a production line while wearing gloves knows the difficulty of trying to control on-screen testing programs with the use of a mouse. The KL3116T touchscreen is the easiest and most convenient way to solve problems with user interactive production line testing programs. As many as 31 additional switches can be daisy-chained together, so that up to 512 computers can be controlled from a single keyboard, touch screen, and mouse console. You can also conveniently share USB peripherals attached to the KL3116T with computers on the same level. The KL3116T is the first Dual Rail Touchscreen KVM Switch of its kind that requires no additional software to operate; simply connect the KL3116T to your installation and begin using it immediately.